Sometimes apps have their own mind and do not behave as we wish. 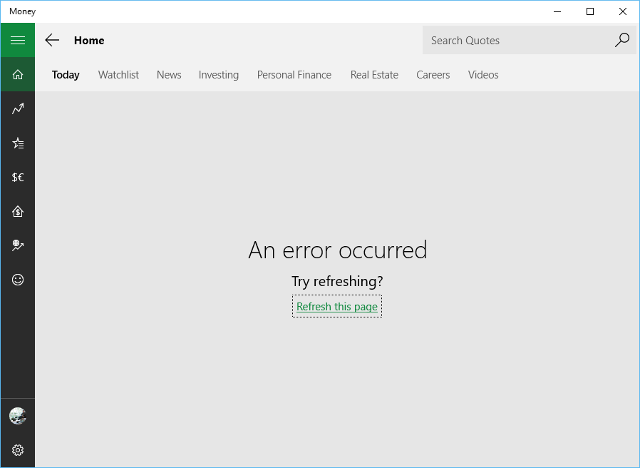 I have dealt with a problem where Microsoft MSN Money App for Windows 10 displays the following message on several tabs “An error occurred” and “Try refreshing?” with a link to “Refresh this page.” Refreshing the page never helped. I tried reinstalling the app, resetting Internet Explorer settings, and registering the App Store with PowerShell, but nothing corrected the problem. I was able to fix this problem, but trying these steps are done so at your own risk. I did not look at all the implications (including system security) of taking ownership as described below or the ramifications of deleting the wrong folders to your other apps. Delete the three folders that start with “Microsoft.BingFinance.” DO NOT DELETE ANY OTHER FOLDERS.